Alternative Health A to Z! Alternative health from A to Z: welcome! Maybe you're wondering which alternative health treatments work for which maladies? Or, you wonder what benefits you may hope to reap from actions you are already taking. So many options. Which will benefit you the most? The A to Z cross references you'll find from this page may help! The photo at right shows a practitioner giving a reiki treatment to a patient...something I've never seen nor experienced first-hand. Does it work? I was curious, and my thirst for answers led me to research in the broad and fascinating area of alternative health. 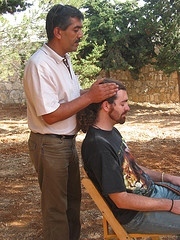 To read about Reiki philosophy and therapists, click on the photo-link. When I began to gather information for this site, I found more connections and uses of alternative remedies than I had suspected. Many more! For instance, I suspected there was more to do in response to cancer than surgery, radiation and chemotherapy--the three methods that one cynic lumped together as "cut, burn and poison." We're just scratching the surface, too. If you're reading this page, it's because you want options. Whatever your highest priority is--health care that's natural, healthy, effective or safe--knowledge is power. Cruise these cross-references and find the next guide post for your search. It's your body; who better to direct the care than you? And, as always, write to me it you have requests for more information, suggestions for areas to research, etc. I'd love to hear your feedback! To the page on alternative remedies and treatments for cancer, click here. Mayo Clinic researchers have 11 alternative treatment options to recommend for those who have cancer. "Hope is just as important as any pill or chemo or diet." Also as a result of my research, I saw two major patterns: data organized by symptoms--malady, concern, issue--then listing effective treatments. I call this Malady to Treatment. The second pattern lists a treatment, therapy or action (like yoga)--then its proven benefits. I call this one Therapy to Benefits. 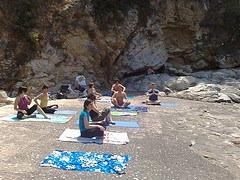 For a page dedicated to the benefits of yoga, click on this photo link. Or return from Alternative Health A to Z to the Home Page.